Bass Culture reach that magnificent milestone of 50 releases with an extra special EP from someone who has become part of label’s inner circle, the infallible Mr G. Set up in 2009 by Paris stalwart D’Julz, Bass Culture Records has maintained a consistently high level of music, crossing from techno into house and back again, always with a focus on quality over quantity. Mr G delivers two special gems from his arsenal of weaponary to mark the 50th Bsss Culture release. 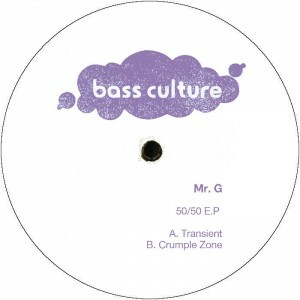 The first, ‘Transient’ sees Mr G in contemplative mood, taking a studied approach with this deep, soulful cut. Softened pads are drizzled over a punchy low end, with tough, crisp beats supporting a stirring vocal which urges everybody to get up on their feet. The nineties organ lick gives it an almost sorrowful feel, and those pads continue to takes us up to the skies. A beauty. On the flip, ‘Crumple Zone’ goes straight for the jugular with a driving b-line, alarming stabs and finger-clicking percussion to get that head nodding. Combined with garbled, hypnotic vocal clips, it’s a mesmerising, eyes down cut for the late night heads. Towards the latter part of the track, a naughty riff comes in and adds another layer of sleaze to proceedings. And there you have it, Mr G proves yet again why he’s such a all-round don and Bass Culture celebrates 50 releases with panache. This entry was posted on February 26, 2016 at 10:03 and is filed under Release.